At Wednesday's elementary school assembly, middle school students Polina L. and Eileen F., gave a presentation to the elementary students and their teachers about what we can do as a school to stay green. Polina and Eileen first presented why recycling and composting is important to our planet - and wanted to demonstrate what happens when we don't take care of our environment. They showed a picture of a beach filled with trash, which elicited a strong reaction from the audience of elementary students. Throughout the presentation, the room was quiet and the attention was focused on our two middle schoolers, who passionately talked about the subject. Their presentation included a slide which told the elementary students that "over 60% of ISTP's trash should be in the compost bin, not the trash." In addition to their presentation, Polina and Eileen interacted with the elementary students by demonstrating which trash items should go in which bin, and asked for audience participation. 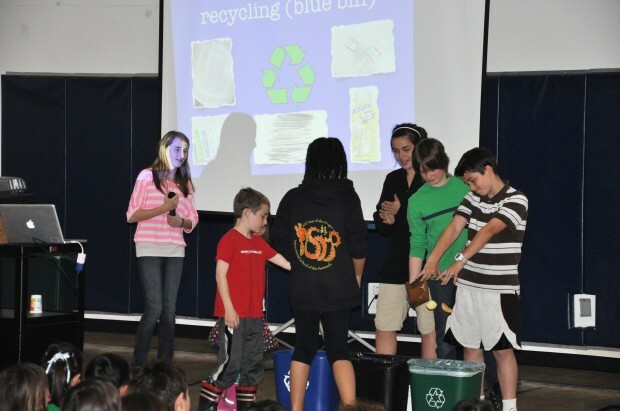 Many hands were eagerly raised, and five students were selected to go to the front of the room and show what they've learned -- what items should go in the garbage, recycling, and compost bins. Our teachers were also similarly educated by Polina and Eileen, who announced that "your tea bags and coffee also belong in the compost!" It was a great way for our students to expand on their communication skills through public speaking, but also a nice way to teach our younger students about proper green habits. Over the past few years, ISTP has made great strides to be a green school. For example, everything used at hot lunch - from silverware, to boxes, to plates and napkins, are all compostable. ISTP is part of the Green School Alliance and is proud to continue our efforts on reducing waste.